Visit us at EMS World Expo Booth #547 to see the latest in narcotics and key security! 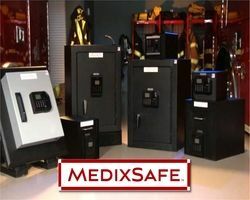 MedixSafe manufactures high-security electronically-controlled narcotics, key and asset protection cabinets. Our multiple solutions utilize the most current access control technology, placing us a cut above the competition. We offer dual or triple user authentication, biometrics and inventory tracking with an audit trail of every access. Our TCP/IP or Wi-Fi equipped MedixSafe units allow you to add, delete and modify users and download event logs from an administrator's desk or remotely. We have been providing peace of mind in the security industry for over 30 years. Our unparalleled service, competitive prices, and overall value are why our loyal customers won't go anywhere else. We look forward to serving you! Request more product info from MedixSafe.